The Strongest, Fastest, and Easiest Aluminum Fabrication or Parts Repair. Will it work for your job? YES! This high-strength brazing rod allows you to repair or fabricate aluminum stronger than a TIG welding machine, without the machine. No welding aluminum needed! All you need to repair any metal stronger than new is a heat source (propane or mapp gas), a turbo tip, or oxy-acetylene, and our material. This new repair technology performs well on aluminum, cast aluminum, pot metal, copper, magnesium, and all white or porous metals. You can easily repair corroded or oil-impregnated areas that can be next to impossible to fix using welding machines with aluminum welding rods or other brazing products. Saves you time – Repairs are fast and simple, brazing aluminum with our HTS-2000 or cast iron with our HTS-528 brazing rods. Saves you money – Cheaper than welding machines or buying new or used parts. Lets you do it yourself – Regardless of your experience anyone can easily braze aluminum just by reading our 1 page instruction sheet, guaranteed! Does the impossible! – Accomplishes many repairs even after a welder says it can’t be done stronger than welding and even repairs oily or oxidized metals. No we never sell or share your e-mail! Imagine getting stronger, better results than welding, by using our high-strength brazing rods and just a torch – the kind of propane or mapp gas torch you probably already have or can easily pick up at your local hardware store. Stronger – More tensile strength plus our brazing rods have the highest level of elongation you can buy to last a lifetime using our HTS brazing rod. Easier – No flux or mixes. No special brush needed like other inferior brazing alloys where you need a stainless brush. Better Penetrating – Penetrates past impurities like antifreeze, oil, and corrosion. Even repair metals you just cannot weld or repair with conventional Mig or Tig welders. More than 30,000 satisfied Dealers, Machine Shop, and Repair Shop Professionals will tell you after trying all other products to repair aluminum and cast, our products are the only ones they use and trust. Just a few of the many metal parts that can be easily repaired! SPECIAL 50% OFF INTERNET ORDERS ONLY. HTS-2000 Brazing Rods for all “non-ferrous” alloys like Aluminum, Cast Aluminum, Die Cast, Aluminum Magnesium, Pot Metal, Zinc, Copper, Bronze, Brass, Titanium, Silver, Stainless, Nickel and Anodized parts. HTS-528 Brazing Rods for any ferrous alloys like Cast Iron, Steel, Brass, Nickel, all hard surface alloys. Still have questions about Aluminum Repair, Welding or Brazing? Click here to see our Frequently Asked Questions. We offer both the HTS-2000 and HTS-528 brazing rods. Repairs aluminum, cast aluminum, pot metal, copper, magnesium, and all white or porous metals. 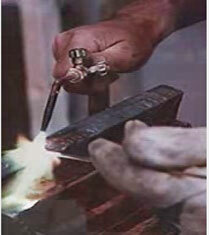 For close-fit joining and repairs on all cast iron, steel, copper, bronze, nickel, and brass. We used HTS-2000 to repair several expensive parts the first week we had it. HTS-2000 has proven to be the strongest aluminum repair we’ve ever seen. It’s amazing!